Leaving the now free and happy town to jubilate in its deliverance from the enemy, Joan of Arc went by Blois and Tours to Chinon. At Tours the King had come to meet the Maid. When within sight of the King, Joan dismounted and knelt before him. Charles came forward bareheaded to meet her, and embraced her on the cheek; and, to use the words of the chronicler, made her 'grande chère'. It was on this occasion that the King bestowed on Joan of Arc the badge of the Royal Lily of France to place in her coat-of-arms. The cognizance consisted of a sword supporting a royal crown, with the fleur-de-lis on either side. Joan now strongly urged the King to lose no time, but at once go to Rheims, to be crowned. The fact of his being crowned and proclaimed King of France would add infinitely to his prestige and authority; he would then no longer be a mere Dauphin or King of Bourges, as the English and Burgundians styled him. But now Joan found how many at Court were lukewarm. The council summoned to deliberate on her proposal alleged that the King's powers and purse would not enable him to make so long and hazardous an expedition. Joan used every argument in favour of setting out forthwith for Rheims: she declared that the time given to her for carrying out her mission was short, and, according to the Duke of Alençon's testimony, she said that after the King was crowned she would deliver the Duke of Orleans from his captivity in England, but that she had only one year in which to accomplish this task; and therefore she prayed that there might be no delay in starting for Rheims. 'Do your voices inspire this advice?' asked the King's confessor. To this Jesuitical query, Joan, in her simple and straightforward manner, answered the priest, that when she met with people who doubted the truth of her mission she would retire to her room and pray, and then voices returned and spoke to her:—'Go forward, daughter of God, and we will assist you,' and how hearing those voices and those words she would rejoice and take courage, and only long that her then state of happiness might last always. While telling them these things she seemed a being transformed, surrounded by a something Divine and holy. It was not unnatural that the King and his councillors should hesitate before making up their minds to undertake the journey to Rheims, for the English were posted in force at Beaugency, at Meun, where Talbot was encamped, and at Jargeau. They also held a strong position on the Loire; it would be difficult to reach Rheims without encountering some of their forces. Jargeau had been attacked, indeed, by Dunois and Xaintrailles, but unsuccessfully; and there was real danger in going northwards while the English were still so plentiful and so strongly entrenched in the towns of the centre and south of France. Another reason for delaying the journey to Rheims and the ceremony of the coronation, was that some time must elapse before the princes and great nobles, who would have to take part in the coronation, could assemble at Rheims. Joan, thus thwarted in her wish of marching directly on to Rheims, suggested driving the English from their fortresses and encampments on the Loire. To this scheme the royal consent was obtained, and the Duke of Alençon was placed in command of a small force of soldiers. Joan directed the expedition, and it was ordered that nothing should be done without the sanction of the Maid. The church before which this scene took place at Selles-sur-Cher still exists, a fine massive building, dating from between the eleventh and thirteenth centuries; but the old cross that stood before it, to which Joan of Arc's black charger was led, has long ago disappeared. In my opinion, this graphic description of the Maid of Orleans, written by Guy de Laval to his parents, is the best that has come down to our day of the heroine. There is to us a freshness about it which proves how deeply the writer must have been stirred by that wonderful character; it shows too that, with all her intensely religious and mystic temperament, Joan of Arc had a good part of sprightliness and bonhomie in her character, which endeared her to those whose good fortune it was to meet her. The incident of the black charger standing so still beside the cross, and the figure of the Maid, mystic, wonderful, in her white panoply, with her head bare—that head which, in spite of no authentic portrait having come down to us, we cannot but imagine a grand and noble one—make up a living picture of historic truth, far above the fancies evolved out of the brains of any writer of fiction—for is it not romance realised? The eagerness to accompany Joan of Arc in this expedition of the Loire was great. The Duke of Alençon wrote to his mother to sell his lands in order that money might be raised for the army. The King was unable or unwilling to pay out of his coffers the expenses of the campaign. From all sides came officers and men eager for new victories under the banner of the Maid. The faubourgs of the town of Jargeau were attacked and taken, but before storming the place, Joan, according to her habit, sent a summons to the army. She bade the enemy surrender: doing so, he would be spared, and allowed to depart with his side-arms; if he refused, the assault should be made at once. The English demanded an armistice of fifteen days: hardly a reasonable request when it is remembered that Fastolfe, with his reinforcements, might any day arrive before Jargeau. Joan said they might leave, taking their horses with them, but within the hour. To this the English would not consent, and it was decided to attack upon the following morning. These words may well be called Joan of Arc's life motto, and the secret of her success. 'Had she,' she asked Alençon, 'ever given him reason to doubt her word?' And she reminded him how she had promised his wife to bring him, Alençon, back safe and sound from this expedition. Joan seems throughout that day's fighting to have watched over the Duke's safety with much anxious care; at one hour of the day she bade him leave a position from which he was watching the attack, as she told him that if he remained longer in that place he would get slain from some catapult or engine, to which she pointed on the walls. Hardly had the Duke left the spot when a Seigneur de Lude was struck and killed by a shot from the very engine about which Joan had warned Alençon. Hour after hour raged the attack; both Joan and Alençon directed the storming parties under a heavy fire. A stone from a catapult struck Joan on her helmet as she was in the act of mounting a ladder—she fell back, stunned, into the ditch, but soon revived, and rising, with her undaunted courage, she turned to hearten her followers, declaring that the victory would be theirs. In a few more moments the place was in possession of the French. Suffolk fled to the bridge which spanned the Loire: there he was captured. A soldier named William Regnault beat him to the ground, but Suffolk refused to yield to one so low in rank, and is said to have dubbed his victor knight before giving him up his sword. Besides Suffolk, a brother of his was taken, and four or five hundred men were killed or captured. The place was pillaged. The most important of the prisoners were shipped to Orleans. The following day Joan returned to Orleans with Alençon, where they remained two days to rest their men, after which they proceeded to Meun. This was a strongly fortified town on the Loire, about an equal distance from Orleans on the west and from Jargeau on the east. The first success of the French was the occupation of a bridge held by the English. They then descended the river, and attacked the town of Beaugency. This town had been abandoned by the English garrison, who had thrown themselves into the castle. Here it was that the army of the Loire was joined by the Constable de Richemont, who could be almost considered as a little monarch in his own territory of Brittany. This magnate appears to have been a somewhat unwelcome addition to Joan and Alençon's army. He was, however, tolerated, if not welcomed. Alençon and the Constable, who had till now been at enmity, were reconciled by Joan's influence, and she paved the way for a reconciliation between Richemont and the King. It was high time that all the French princes should be reconciled, for the danger from the invaders was still great even in the immediate circle of the Court and army. A strong body of men was known to be on the way from Paris, under the command of Fastolfe, and Talbot was marching to meet him with a force from the Loire district; they soon met, and together proceeded directly upon Orleans. Fastolfe appears to have been disinclined to attack, his force being smaller than that of the French; but Talbot was beside himself with rage at having to retreat from Orleans, and swore by God and St. George that, even had he to fight the enemy alone, fight he would. Fastolfe had to give way to the fiery lord, although he told his commander that they had but a handful of men compared to the French; and that if they were beaten, all that King Henry V. had won in France with so much loss of life would be again lost to the English. Leaving some troops to watch the English garrisons in the castle of Beaugency, Joan marched against the English. The hostile armies met some two miles between Beaugency and Meun. The English had taken up a place of vantage on the brow of a hill; their archers as usual were placed in the front line, and before them bristled a stockade. The French force numbered about six thousand, led by Joan of Arc, the Duke of Alençon, Dunois, Lafayette, La Hire, Xaintrailles, and other officers. The English were still strongly fortified in the little town of Meun. A portion of their army left Beaugency in order to effect a junction with their other comrades, and in perfect order Talbot commenced his retreat on Paris, taking the northern road through the wooded land of La Beauce. They were closely followed by the French, but neither army had any idea how near they were to one another till a stag, startled by the approach of the French, crossed the English advanced guard. The shouts of the English soldiers on seeing the stag gallop by was the first sign the French had of the propinquity of their foes. A hasty council of war was held by the French commanders. Some were for delay and postponing the attack until all their forces should be united; and these, the more prudent, pointed out the inferiority of their force to that of the enemy, arguing that a battle under the circumstances, in the open country, would be hazardous. Joan of Arc, however, would not listen to these monitions. 'Even,' she cried, 'if they reach up to the clouds we must fight them!' And she prophesied a complete victory. Although, as ever, anxious to command the attack, she allowed La Hire to lead the van. His orders were to prevent the enemy advancing, and to keep him on the defensive till the entire French force could reach the ground. La Hire's attack proved so impetuous that the English rearguard broke and fled back in confusion. Talbot, who had not had time, so sudden and unexpected had been the French attack, to place his archers and defend the ground, as was his wont, with palisades and stockades, turned on the enemy like a lion at bay. Fastolfe now came up to Talbot's succour; but his men were met by the rout of the rearguard of the broken battle, and the fugitives caused a panic among the new-comers. In vain did Sir John attempt to rally his men and face the enemy. After a hopeless struggle, he too was borne off by the tide of fugitives. One of these, an officer named Waverin, states the English loss that day to have amounted to two thousand slain and two hundred taken, but Dunois gives a higher figure, and places the English killed at four thousand. This battle of Patay was the most complete defeat that the English had met with during the whole length of that war of a hundred years between France and England; and, to add to its completeness, the hitherto undefeated Talbot was himself amongst the taken. ''Tis the fortune of war,' was the old hero's laconic answer. The effects of this victory of Patay on the fortunes of the English in France were greater than the deliverance of Orleans, and far more disastrous, for the French had now for the first time beaten in the open field their former victors. The once invincible were now the vanquished, and the great names of Crecy, Poitiers, and Agincourt had lost their glamour. When the news was known that the English under Talbot and Fastolfe had been beaten, and that the great commander for so many years the terror of France had been made a prisoner, and that these mighty deeds had been accomplished by the advanced guard of the French army under the inspiration of the Maid of Orleans, the whole country felt that the knell of doom of the English occupation in France had rung. There is an anecdote relating to Joan of Arc at Patay that should find a place here. After the battle, and while the prisoners were being marched off by the French, Joan was distressed to see the brutality with which those captives unable to pay a ransom were treated. One poor fellow she saw mortally wounded by his captors. Flinging herself from her saddle, she knelt by the side of the dying man, and, having sent for a priest to shrive him, she remained by the poor fellow's side and attended to him to the end, and by her tender ministrations helped him to pass more gently over the dark valley of death. Michelet discovered this story in the deposition of Joan of Arc's page, Louis de Contes, who was probably an eye-witness of the scene. With this brilliant victory at Patay closed Joan of Arc's short but glorious campaign on the Loire. Briefly, this was the career of her victories:—On the 11th of June the Maid attacked Jargeau, which surrendered the next day. On the 13th she re-entered Orleans, where she rallied her troops. On the 15th she occupied the bridge at Meun, and the following day she attacked Beaugency, which yielded on the day after. The English had in vain hoped to relieve Jargeau: they arrived too late. After the fall of Beaugency they fell back, and were defeated at Patay on the 18th. A wonderful week's work was this campaign, ordered and led by a maiden of eighteen. What made Joan of Arc's success more remarkable is the fact that among the officers who served under her many were lukewarm and repeatedly foiled her wishes. And it is not difficult to trace the feeling of jealousy that existed among her officers; for here was one not knight or noble, not prince, or even soldier, but a village maiden, who had succeeded in a few days in turning the whole tide of a war, which had lasted with disastrous effects for several generations, into a succession of national victories. This professional jealousy, as one may call it, among the French military leaders was fomented and aggravated by the perfidious counsellors about the King. The only class who thoroughly appreciated and were really worthy of the Maid and her mission, were the people. And it is still by the people that everlasting gratitude and love of the heroic Maid are most deeply felt. While Joan was gaining a succession of victories on the Loire, the indolent King was on a visit to La Tremoïlle at his castle of Sully-sur-Loire. Accompanied by Alençon and the Constable Richemont, Joan repaired to Sully. She had promised to make the peace between Charles and Richemont, and as the Constable had brought with him from his lands in Brittany fifteen hundred men as a peace-offering, the reconciliation was not a matter of much difficulty. La Tremoïlle saw with an evil feeling the ever-growing popularity of Joan, and feared her daily increasing influence with the King; but he could not prevent the march on Rheims, much as he probably wished to do so. It was arranged that the army should be concentrated at Gien. From Gien, Joan addressed a letter to the citizens of Tournay, a town of doubtful loyalty to Charles, and much under the influence of the Burgundian party. She summoned in this letter those who were loyal to Charles to attend the King's forthcoming coronation. On the 28th of June the King and Court left Gien, on their northern march. That march was not a simple matter, for a country had to be traversed in which the towns and castles still bristled with English garrisons, or with doubtful allies. Auxerre belonged to the Burgundian party, always in alliance with the English; Troyes was garrisoned with a mixed force of English and Burgundians; and the strongly fortified places on the Loire, such as Marchenois, Cosne, and La Charité, were still held by the English troops. Charles' army had no artillery; it was therefore out of the question to storm or besiege towns however hostile, and the counsellors and creatures of the King urged him not to risk the dangers of a journey to Rheims under such disadvantageous circumstances. Joan, wearied out by the endless procrastination and hesitation of the King, left him, and preferred a free camp in the open fields to the purlieus of the Court, with its feeble sovereign and plotting courtiers. Joan of Arc on this occasion may be said to have 'sulked,' but she showed her usual common sense in what she did, and her leaving the Court seems to have given the vacillating King a momentary feeling of shame and remorse. Orders were issued that the Court should be moved on the 29th of June. The royal army which started on that day for Rheims numbered twelve thousand men; but this force was greatly increased on its march. By the side of the King rode the Maid of Orleans; on the other side of the King, Alençon. The Counts of Clermont, of Vendôme, and of Boulogne—all princes of the blood—came next. Dunois, the Maréchal de Boussac (Saint-Sevère), and Louis Admiral de Culan followed. And then, in a crowd of knights and captains, rode the Seigneurs de Rais, de Laval, de Loheac, de Chauvigny, La Hire, Xaintrailles, La Tremoïlle, and many others. Before the town of Auxerre a halt was called: it was still under the influence of the English and Burgundians. A deputation waited upon Charles, provisions were sent to the army, but the town was not entered. Outside its fortifications the army rested three days, after which it continued its march to Saint-Florentin, whose gates swung open to the King; thence on to Brinon l'Archevêque, whence Charles forwarded a messenger with a letter to his lieges at Rheims, announcing his approach. On the 4th of July the royal force had reached Saint-Fal, near Troyes. Joan of Arc despatched a messenger summoning that place to open its gates to the King; but Troyes was strongly garrisoned by a force of half English half Burgundian soldiers, and these had sent for succour to the English Regent, the Duke of Bedford. The army of the King arrived before the gates of the town on the 4th of July; a sally was made by the hostile garrison, but this was driven back. Pour-parlers ensued. The King's heralds were informed by the garrison officers that they had sworn to the Duke of Burgundy not to allow, without his leave, any other troops to enter their gates. They went further, and insulted the Maid of Orleans in gross terms, calling her a 'cocquarde'—whatever that ugly term may mean. The situation was embarrassing. How could the town be taken without a siege train and artillery? But to leave it in the rear, with its strong garrison, would be madness. The King's men were in favour of retiring and abandoning the expedition to Rheims. There happened to be within the town of Troyes at this time a famous monk of the preaching kind, named Father Richard. Father Richard had been a pilgrim, and had visited the Holy Land, and had made himself notorious by interminable sermons, for he was wont to preach half-a-dozen hours at a time. Crowds had listened to him in Paris and other places. The English, who probably thought his sermons insufferably long, or too much leavened with French sympathies, drove him out of Paris, and he had taken refuge at Troyes. The monk had heard much of Joan of Arc, and was eager to see and speak with her, but his enthusiasm was mixed with a religious and even superstitious fear in regard to the heroine. He was allowed to enter the royal precincts, and approached the Maid of Orleans with many a sign of the cross, and with sprinkling of holy water. Seeing the good man's terror, Joan told him to approach her without fear. And after convincing him that she was not a demon in any way, she made him the bearer of a letter from her to the people in the town. The negotiations between the army and the burghers lasted five days; the town refusing to admit the King, and the King unwilling to pass the town, but unable to take it by force. Charles was on the point of giving up the attempt to reach Rheims when one of his Council pointed out that as the expedition had been undertaken at the instigation of Joan of Arc, it was only fair her judgment should now be followed, and not that of any one else. Joan was summoned before the Council, when she solemnly assured the King that in three days' time the place would be taken. Mounting her horse, the Maid rode into the camp, and ordered all to prepare to carry out a general assault on the next morning. Anything that could be used in the shape of furniture and fagots, to make a bridge across the town ditches, was collected. Joan, who had now her tent moved up close to the moat, worked harder, says an eye-witness, than any two of the most skilful captains in preparing the attack. She directed that fascines should be thrown into the moat, across which the troops were to pass to the town. Early next day everything was in readiness for the attack, but at this juncture, just as she was preparing to lead the storming party, the Bishop of Troyes, John Laiguise, attended by a deputation of the principal citizens, came from the town with offers of capitulation. The people were ready to place themselves at the King's mercy, owing probably to the terror the preparations made by Joan of Arc on the previous evening had inspired them with, mixed, too, with the superstitious dread they felt for her presence. Had not even the English soldiers declared that, when attacked by the terrible Maiden, they had seen what appeared to be flights of white butterflies sparkling all around her form! How could these good people of Troyes hope to withstand such a power? To add to this fear, it was remembered by the citizens of Troyes that in it had been signed and concluded the shameful treaty by which Charles VII. had been disinherited from his crown and possessions. The people therefore gave in without further struggle. The conditions of capitulation were soon arranged. The burghers were granted the immunity of their persons and their goods, and certain liberties for their commerce. All those traders who held any office at the hands of the English government were to continue the enjoyment of these offices or benefices, with the condition of taking them up again at the hands of the King of France. No garrison would be quartered upon the town, and the English and Burgundian soldiers were to be allowed to depart with their goods. The next day—the 10th of July—Charles and his host entered Troyes in state, the Maid of Orleans riding by the side of the King, her banner displayed as was her custom. When, as had been arranged in the treaty of capitulation, the foreign soldiers began to leave the place with bag and baggage (goods), Joan was indignant at finding that some of these so-called goods were nothing less than French prisoners. This was a thing that she could not tolerate, treaty or no treaty; and, placing herself at the gate of the town, she insisted that her imprisoned countrymen should be left in her charge. The King naturally felt obliged to gratify her; so he released the captives, and paid their ransom down. Before leaving Troyes the next day, William Bellier, who had been Joan's host at Chinon, was left as bailiff of the place, along with other officers. Thence the army moved on by way of Châlons. Though still in the hands of the English, a deputation of clergy and citizens met the King, and placed themselves at his orders. While in the neighbourhood of Châlons, Joan of Arc met some friends who had arrived from Domremy; among them were two old village companions, Gerardin d'Epinal and John Morel, to whom she gave her red dress. In conversation with these she said that the only dread she had in the future was treachery: a dread which seems to point in some strange prophetic manner to the fate which was so soon to meet her at Compiègne. 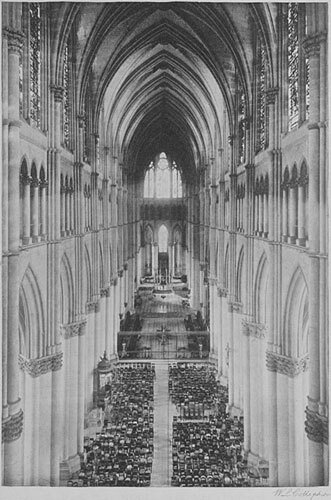 It was on the evening of the 16th of July that the royal host at length came in sight of the massive towers of the great cathedral church of Rheims. It was at Sept Saulx, about eight miles' distance from Rheims, that the King waited for a deputation to reach him from the town. Rheims was still filled with the English and Burgundian adherents, and had Bedford chosen to throw, as he could well have done, a force into that place, Charles might yet have been prevented from entering its gates. Perhaps Bedford did not believe in the possibility of Charles arriving at his goal, and had counted on the King's well-known weakness and indecision, and on the hesitation of such men as La Tremoïlle and others of his Council. The Regent had received assurances from the officials in Rheims that they would not admit Charles. But after what passed at Troyes and at Châlons, Charles had not long to wait for a favourable answer from his lieges at Rheims. Indeed, the deputation which met him at Sept Saulx were effusive in their good offices and entreaties that the King should forthwith enter his good city of Rheims. The Archbishop (Regnault de Chartres), who had preceded the King by a few hours to his town, came out to meet the King at the head of the corporation and civic companies. From all sides flocked crowds eager to welcome the King, and even more the Maid of Orleans. In those days the people's cry of joy and triumph was 'Noël! '—but why that cry of Christmas joy had become the popular hosanna, it is not easy to conjecture. 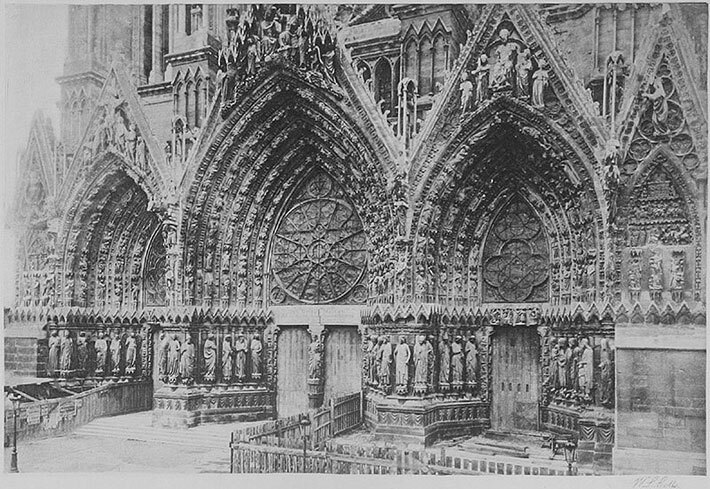 Throughout that night the preparations for the coronation were feverishly made both within and without the cathedral. On the 17th of July, with all the pomp and ceremony that the church and army could bestow, the King was crowned and anointed with the holy oil which four of his principal officers had brought to the cathedral from the ancient abbey church of Saint-Remy. There exist few grander fanes in Christendom than the great cathedral of Rheims. The thirteenth century, so prolific of splendid churches, had expended all its wealth of lavish decoration on the gorgeous portal, with its array of saints and sovereigns, under which passed Charles VII. of France, with the Maid of Orleans on his right hand. Hurried as had been the preparations for the ceremonial, the even then ancient and venerable rites must have deeply impressed the spectators, and the semi-sacred act was carried out with scrupulous care—the King crowned and anointed with the holy oil, surrounded on his throne by the ecclesiastical peers and high dignitaries of the Church, and waited on by the secular peers during the crowning and after at the coronation banquet. At length was accomplished the darling wish of Joan of Arc's heart, for now her King was regarded and sanctioned by all true French persons as King of France, by the grace of God and Holy Church. When the King received the crown from the hands of the Archbishop, a peal of trumpets rang out, with such a mighty volume of sound that the very roof of the cathedral seemed to shake again. Ingres, in his striking picture of Joan of Arc, now in the gallery of the Louvre, represents her standing by the high altar, clad in her white panoply of shining steel, her banner held on high; below bows in prayer her confessor, the priest Pasquerel, in his brown robes of the Order of Augustin; and beyond stand her faithful squire and pages. The heroine's face is raised, and on it sits a radiant look of mingled gratitude and triumph. It is a noble idea of a sublime figure. Many besides the King are said to have shed tears at that moment. Her mission was indeed accomplished: that is to say, if her mission consisted of the two great deeds which while at Chinon she had repeatedly assured her listeners she was born to accomplish. These were, first, to drive the English out of Orleans, and thereby deliver that town; the second, to take the King to Rheims, where he would receive his crown. The other enterprises, such as the wish to deliver the Duke of Orleans from his captivity in England, and then to wage a holy war against the Moslems, may be left out of the actual task which, encouraged by her voices, Joan had set herself to accomplish. But the two great deeds had now been carried out—and with what marvellous rapidity! In spite of all the obstacles placed in her path, not only by the enemies of her country, but by those nearest to the ear of the King, Orleans had been delivered in four days' time, the English host had been in a week driven out of their strongholds on the Loire, and defeated in a pitched battle! The King unwillingly, and with many of his Court opposed to the enterprise, after passing through a country strongly occupied by the enemy without having lost a man, had by the tact and courage of Joan of Arc been enabled to reach Rheims; and after this successful march he had received his crown among his peers and lieges, as though the country were again at peace, and no English left on the soil of France. What was still more surprising was, that all these things should have been accomplished at the instigation and by the direction of a Maid who only a few months before had been an unknown peasant in a small village of Lorraine. How had she been able not only to learn the tactics of a campaign, the rudiments of the art of war, but even the art itself? No one had shown in these wars a keener eye for selecting the weakest place to attack, or where artillery and culverin fire could be used with most effect, or had been quicker to avail himself of these weapons. No one saw with greater rapidity—(that rarest of military gifts)—when the decisive moment had arrived for a sudden attack, or had a better judgment for the right moment to head a charge and assault. How indeed must the knights and commanders, bred to the use of arms since their boyhood, have wondered how this daughter of the peasants had obtained the knowledge which had placed her at their head, and enabled her to gain successes and reap victories against the enemy, which until she came none of them had any hope of obtaining. They indeed could not account for it, except that in Joan of Arc was united not only the soul of patriotism and a faith to move mountains, but the qualities of a great captain as well. That, it seems to us, must have been the conclusion that her comrades in arms arrived at regarding the Maid of Orleans. Dunois stated that until the advent of the Maid the French had no longer the courage to attack the English in the open field, but that since she had inspired them with her courage they were ready to attack any force of the army, however superior it might be. This testimony was confirmed by Alençon also: he declared that in things outside the province of warfare she was in every respect as simple as a young girl; but in all that concerned the science of war she was thoroughly skilled, from the management of a lance in rest to that of marshalling an army; and that as regarded the use of artillery she was eminently qualified. All the military commanders, he said, were amazed to see in her as much skill as could be expected in a seasoned captain who had profited by a training of from twenty to thirty years. 'But,' added the Duke, 'it is principally in her use of artillery that she displays her most complete talent.' And he proceeds to bear his high tribute to her goodness of heart, which she displayed on every possible occasion. Although her physical courage enabled her to face the greatest perils and personal risks, she had a horror of bloodshed, and though her spirit was 'full of haughty courage, not fearing death nor shrinking distress, but resolute in most extremes,' she never entered battle but bearing her banner in her hand; and to the last day of her appearance on the field she strove with all her great moral force to induce the rude and brutal men around her to become more humane even in the hurly-burly of the din of battle. All unnecessary cruelty and bloodshed made her suffer intensely, and we have seen how she ministered to the English wounded who had fallen in fight. As far as she could she prevented pillage, and she would only promise her countrymen success on the condition that they should not prey upon the citizens of the places they conquered. Even when she had passed the day fasting on horseback, Joan would refuse any food unless it had been honourably obtained. As a child she had been taught to be charitable and to give to the needy, and she carried out these Christian principles when at the head of armies; the 'quality of mercy' with her was ever present. She distributed to the poor all she had with her, and would say, with what truth God knows, 'I have been sent for the consolation of the poor and the relief of the needy.' She would take upon herself the charge of the wounded; indeed, she may be considered as the precursor of all the noble hearts who in modern warfare follow armies in order to alleviate and help the sick and wounded. And she tended with equal care and sympathy the wounded among the enemy, as well as those of her own side. This is no invention, no fancy of romance, but the plain truth; for there can be no disputing the testimony of those who followed Joan of Arc and saw her acts. In all things she was pure and saint-like, and her wonderful life, as Michelet has truly said of it, was a living legend. Had she not been inspired by her voices and her visions to take up arms for the salvation of her country, Joan of Arc would probably have lived and ended her obscure life in some place of holy retreat. An all-absorbing love for all things sacred was her ruling idiosyncrasy. From her childhood her delight was to hear the church bells, the music of anthems, the sacred notes of the organ. Never did she miss attending the Church festivals. When within hail of a church it was her wont, however hurried the march, to enter, attended by any of the soldiers whom she could induce to follow her, and kneel with them before the altar. At the close of some stirring day passed in the midst of the din of battle, and after being for hours in the saddle, she would, ere she sought rest, always return thanks to her God and His saints for their succour. Joan also loved to mix in the crowd of poor citizens, and begged that the little children should be brought to her. Pasquerel, her confessor, was always told to remind Joan of Arc of the feast days on which children were allowed to receive the Communion, in order that she too might receive it with these innocents. The army has probably ever been the home of high swearing: the expression in French of 'ton de garnison' is an amiable way of referring to that habit of speech; and we all know ancient warriors whose conversation is thickly larded with oaths and profanity. This habit Joan of Arc seems to have held in great abhorrence. We have seen how she got La Hire to swear only by his stick; to another officer of high rank, who had been making use of some strong oaths, she said: 'How can you thus blaspheme your Saviour and your God by so using His name?' Let us hope her lesson bore fruit. Throughout the land Joan of Arc was now regarded as the Saviour of France. Nor at this time did the King prove ungrateful. In those days nobility was highly regarded. It brought with it great prestige, and much benefit accrued to the holders of titles. Charles now raised the Maid of Orleans to the equal in rank of a Count, and bestowed upon her an establishment and household. The grateful burghers of Orleans, too, loaded her with gifts, all which honours Joan received with quiet modesty. For herself she never asked anything. After the coronation at Rheims, when the King begged her to make him a request, the only thing she asked was, that the taxes might be taken off her native village. Her father, who came to see her at Rheims, had the satisfaction of carrying back this news to Domremy. Although both King and nobles vied in paying honours to Joan of Arc, it was from the common people, from the heart of the nation, that she received what seems to have amounted to a feeling approaching adoration. Wherever she passed she was followed by crowds eager to kiss her feet and her hands, and who even threw themselves before her horse's feet. Medals were struck and worn as charms, with her effigy or coat-of-arms struck on them. Her name was introduced into the prayers of the Church.